Just this past Saturday afternoon, the Markay hosted an informative and interesting lecture by David Sager, who ranks as one of the leading experts on early jazz history in the world. Sager’s topic was Coalton-born Isham Jones, who became one of America’s most renowned songwriters and orchestra leaders in the 1920s and 1930s. With words, photos and recordings, Sager brought alive both the man and his music. The local audience included Coalton Mayor Kim Milliken and her husband, Coalton Councilman Jim Milliken, as well as local musicians and music leaders such as Wellston High School Band Director Josh Willett, former Vinton County High School Band Director and current First Presbyterian Church Choir Director Paul Hogue and the Jackson songwriting duo of Mike Morgan and Jeff Elliott. The lecture was provided free of charge, thanks in part to support from the Ohio Humanities Council, The Southern Hills Arts Council (SHAC), and The Ted Lewis Museum at Circleville. Isham Jones will remain in the local spotlight for a while longer. Jones is featured in the current exhibit at the Lillian Jones Museum at 75 Broadway St., along with Jackson County-born composers Frank Crumit and Carl Summers. That exhibit will remain on display until mid-June. Also, there will be a concert at the Markay on Sunday, June 2, at 3 p.m. featuring Jones’ music as performed by the Joseph Rubin and his 11-piece orchestra and two vocalists. The Markay would like to thank SHAC, the Lillian Jones Museum, the Jackson Historical Society, the Coalton Historical Society, and the Ted Lewis Museum for providing the financial support to make this event possible. The Markay supports the literary arts as well as the visual arts. Accordingly, last Sunday afternoon, Jackson author Karisa DeLay was featured in a combined forum/book-signing event for her latest work, Before the World Was Lost: A Journey to Eden. This marked DeLay’s first non-fiction book after she had already written two works of fiction, The Crystal Gate and Four Rivers. In her new book, DeLay tackles a deep and much debated topic -- man’s creation. DeLay brings together the Bible and science to provide her insight and answers to the mystery as she “unlocks a new pathway back to the Garden of Eden, Noah’s Ark, and the Tower of Babel to prove the history of Genesis”. Amazingly, DeLay has proven to be a prolific writer in spite of the challenges of being a wife and the mother of four young children while owning and operating her own business, The Local Gallery Spa and Salon at 225 Pearl St. in downtown Jackson. Copies of Before the World Was Lost: A Journey to Eden can be purchased at The Local Gallery Spa and Salon for $10 each or online at slightly higher prices through the Barnes and Noble and Amazon websites. More live music will fill the Markay auditorium this Saturday afternoon when Texas-based singer Justin Gambino is the featured performer for a 3 p.m. concert. Gambino has performed at several churches in the local area, but this will be his first performance at the Markay. Gambino is a second cousin to well-known Jackson resident Mike Gambino, who retired last year as superintendent of the wastewater department for the City of Jackson, and is active in many civic and community events and organizations, including the Jackson Area Kiwanis Club. Advance tickets for the Justin Gambino concert are available for $15 each, or $17 day of show. Doors will open at 2:30 p.m. Meanwhile, one of the Markay’s biggest entertainment draws, Elvis Tribute Artist Dwight Icenhower, will return for a concert on Saturday evening, July 6. His two previous Markay concerts were sellouts and there are not too many tickets remaining for his upcoming performance. Those who are drawn to live theatre will want to circle the dates of Saturday and Sunday, May 11 and 12 when Apple City Players present the comedy play, A Handful of Rainbows. Performances are scheduled for 7 p.m. Saturday and 3 p.m. Sunday and tickets are now available, $15 in advance and $17 on the day of the shows. Rehearsals are already underway with David Warner serving as the director and Frances Gibser as a key assistant. The cast includes: Laura Miller, Laura Fain, Cynthia Stiffler, Doug Sharp, Matt McKee, Adam Hollingshead, Sue Nelson, Mary Bracey, Jeremy Harley, and Evelyn Harley. As for the current art exhibit in the gallery, the “New Direction in Art” exhibit featuring University of Rio Grande, will continue through this Sunday, April 14. The next exhibit, featuring the artwork of accomplished artist Gerry Enrico, will be unveiled at an opening-night reception on Thursday evening, April 18. 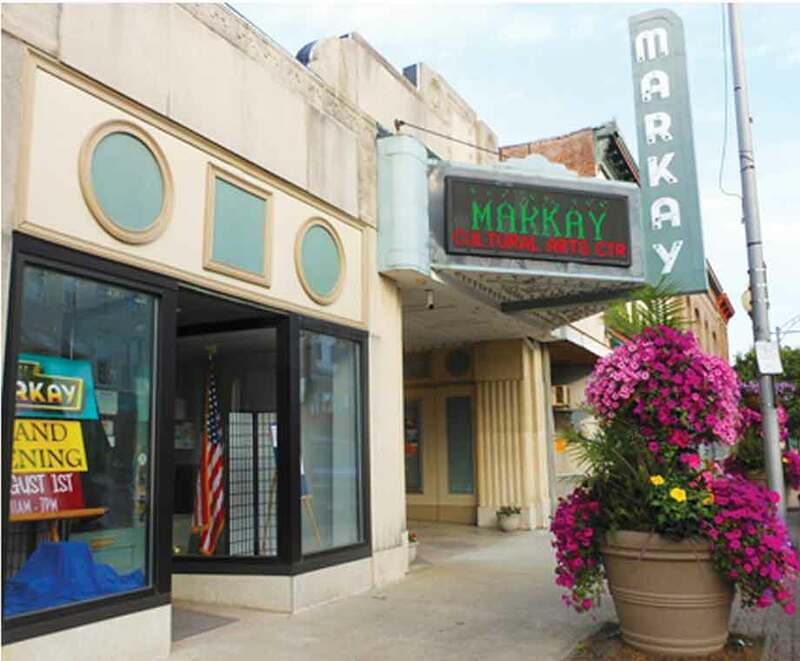 The Markay, of course, is operated by the Southern Hills Arts Council (SHAC), a non-profit board manned by many hard-working volunteers who are dedicated to promoting and presenting the arts in Jackson County. Total Media’s own Cortney Leach took over as board president at the beginning of the year. Carma Baker resigned as director of operations earlier this year and that position will remain unfilled for the time being with other staffers and board members stepping up to help fill the void. However, SHAC has brought on a grants-writer to help with the ongoing need to pursue funding support. The Markay also presents classic movies from yesteryear, which are shown free, thanks to the sole sponsorship of Nea Henry and Appalachia Realty. The Goonies will be shown on Saturday, April 20, at 3 p.m. and 7 p.m. The Marx Brothers’ Duck Soup is scheduled for Saturday, May 25, also at 3 p.m. and 7 p.m. While it was a mammoth and costly achievement to renovate the Markay and its auditorium, it also requires a major investment to operate the facilities. Ticket sales only cover about 40 percent of the operating costs; therefore, the remaining 60 percent must come from contributors in order to keep the doors open and offer the best attractions possible. For more information on how to support the Markay and SHAC financially or as a volunteer, check out the webpage at www.markayjackson.com. You can also access information by following the Markay on Facebook. GREAT JOB!!! A million thanks for strong, unyielding support from day one! This comment has been hidden due to low approval.